Gary, I will ask again. Guess your on his ignore list too. You can test the transistors in the circuit. When a transistor is turned on by its 47k resistor on its base to +3V then the capacitor turns it off. make the test by simply shorting the base to 0V and it should turn off. When I went out the the work shop the other day I left the circuit drawing in the house. It is 24 degrees my hips hurt me worse than my back it is a big deal to go back to the house to get circuit drawing. Parts all tested good but today I checked parts again they are still good but now I see I have 47K where 470 should be, and 470 where 47K should be. Today I have 1 dual flasher working with resistors in correct place, good capacitors, and LEDs soldered on the correct way. Maybe today I make 4 more flasher PC boards with only the transistors and caps, tracking shows my resistors should be here Friday. I have 11 LED flashers along driveway, front of house, east side of house, garage, work shop, wow they show up good after dark. I should put LED flashers on west side of house to make it look like there is some type security system over there too. My original flasher has been flashing 16 days it will be interesting to see how long it lasts with those worthless Harbor Freight batteries. I bought better battery a few days ago. You said you tried connecting LEDs in parallel. They both will light only if they both have exactly the same forward voltage but the forward voltage varies between LEDs even if they have the same color. You show the schematic that is missing the very important current-limiting resistor. Then the LED and/or BC547 might burn out and the flash duration will be so short that the LED appears to be dimmed, as you found. I don't know how to design the circuit, I only know how to build it. I can experiment with parts to make circuit better or worse. I understand the capacitor charges through the resistor. Larger resistor makes capacitor charge slower. Larger capacitor charges slower than small capacitor. Larger capacitor holds more charge than small capacitor. I have no clue how 2 transistors make the LED flash. I can see when 3v is turned ON circuit does not flash for 3 seconds until capacitor charges through the resistor. Capacitor discharges through LED then the cycle starts over. 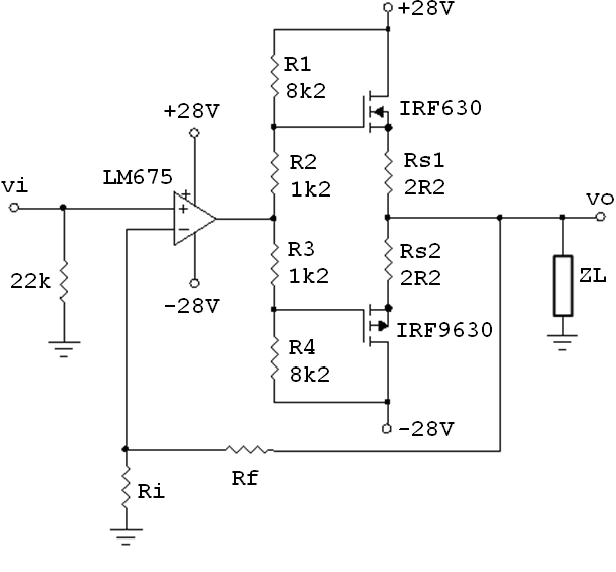 I have forgotten the formula to calculate how long it takes for resistor to charge capacitor, I can not find it online probably because I don't know the correct search words to find it. I wish I understood transistors better when I was in college we learned tubes, every thing was tubes then. I looked in Google for Capacitor Charging and found this graph that shows that R x C= one time constant which is a 63% charging voltage. The capacitor must charge to about 0.8V for the transistors to turn on then discharge a little for the transistors to turn off. The capacitor does not discharge through the LED, instead it discharges through the transistors. I built this circuit, with 3v it blinked every 10 seconds. I was surprised to learn with 4.5v it blinks every 15 seconds. LED is very bright. It needs to blink faster about 3 seconds. I have no 180 ohm resistor so I used two 100 ohm in series. My resistors arrived, I have 6 more flashers built and installed around the house. I lost count, I think I have 16 LED flashers. I think that is enough, I will go out in the dark to night to look around to see if I need anymore. I ordered 1 security camera to test so we can decide if this is a good camera to have. I ordered it Dec 27 it is still not here. I need to order a camera from someone else. Walmart has motion detector hunting cameras AA batteries last for a very long time. I wonder if this joule thief flasher works on a Red LED on 1.5v this might be a fun project but i don't really need it. A Joule thief operates the LED at a low current so it is fairly dim and the battery current is higher than the LED current but is fairly low. The transformer boosts the voltage high enough to light an LED. The circuit oscillates and turns the LED on and off at a high frequency. Then the LED appears to be turned on dimly all the time. I hope the criminals don't shoot or steal all your flashers. They wouldn't even be around the house if he would sell those valuable spools of lead solder. That's what they're after. Joule thief is interesting. Original circuit calls for 1 uf capacitor LED lights up bright but does not appear to blink. I changed the capacitor to 10uf hoping to show down the blinking only thing that happened LED got brighter. I figure it have to be high Hz to fast to see blinking other wise transformer will not work but I tried a 100uf cap anyway the LED got much brighter. LOL Original circuit called for 2T and 12T transformer coils. I have 20 choke coils 30T each 99 cents free postage from china. Turn ratio on the transformer is 6 to 1 so 30/6 = 5T. I tried 5T hook up wire wound over the 30T choke wow the LED is bright. Red LED will not light up on 1 AA battery but it will with this joule thief circuit. Joule thief will not work in 1 hearing aid battery. Joule thief lights up all my LEDs very bright makes no difference what color LED is. This circuit must use a lot of power it will not work with 1 AAA battery, its an old battery that tests 1.556v. I ran the joule thief circuit for about 4 minutes LED suddenly went dim, flickered for 30 minutes then stopped working. After bring off a few minutes LED came on dim and flashed like a bad connection. I though maybe battery is dead already but it turns out LED is bad. I decided my 6T coil needs to be 7T to lower the voltage but after looking at my coil it is actually about 5 1/4 turns instead of running the wire all the way around the toroid i took the short cut to get it soldered to where it needed to be. Wire was too short to get 6T so I used a different wire, this time i made sure i have 6T now the LED burns not so extremely bright like before. Then I changed coil to 7T blue LED will not light up but Red will. I changed the coil back to 6T and changed 100uf cap to 10uf it works perfect with blue LED. I added an on/off switch this time. This is a sensitive circuit and another good educational project. What can I build next? Replace the LED and install a 1k resistor in series with the LED and see what happens. I see that your battery is a Sunbeam "Super Heavy Duty" cheap Chinese junk sold at The Dollar Store. Its internal chemicals are mostly rice. Most Joule Thief circuits shown in Google do not use the capacitor nor the 10 ohms resistor in your circuit and use 20 turns on each coil winding. The transistor will probably be destroyed if you ever operate the circuit without the LED. There is no way to get 20 turns of hook up wire on this tiny choke coil. I don't have any enamel coated copper wire. I could experiment with a resistor in series with the LED. I decided the back yard should have LED flasher too so today I made several more. Now I have 21 flashers and no more RED color LEDs. It would be nice to have more Red LEDs in case I need some. A resistor in series with the speaker will increase the collector and reverse=base voltages maybe high enough to zap the transistor. A speaker is driven from AC, not DC. An audio amplifier has two output transistors or Mosfets for them to produce AC with push-pull action. 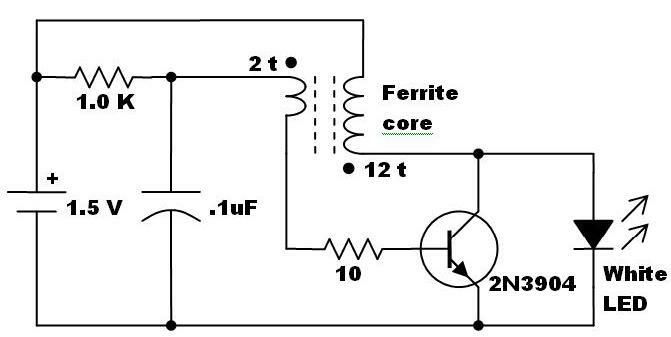 A single transistor or Mosfet drives a speaker with DC pulses which is bad since the cone moves only half of its usual push-pull motion. That is interesting, I never thought of that but I know that is right. Speaker construction puts the speaker coil in center of the magnet so it can move both directions. I built several push pull tube amps 45 years ago but never a transistor amp. I did google search for push pull mosfet amplifiers and found this. It looks like an LM386 will drive 2 mosfets. These linear MOSFET amps (I.e. not Class D) look good on paper with standard switching mosfets IRF but the bias must be set for each specific mosfet, then, even with perfectly set bias, they sound like crap if you change the volume or room temperature changes enough to make the bias drift. A better option is to design around Lateral Mosfets. They have been in/out of production by Hitachi (now Renesis). Also, they seem to be a prime target for Chinese counterfeiters - so buyer beware. Using Mosfets at the output of an audio amplifier requires a fairly high power supply voltage to get much output power because they need a much higher bias voltage than ordinary power transistors. You gain nothing by using mosfets driven by an LM386 because the max supply voltage of an LM386 is only 12V for most of them and the voltage loss of Mosfets is at least 3.5V each. With a 12V supply, the output swing of an LM386 is only 5.2V peak which produces only 1.7V peak at the speaker. Then the output power of this Mosfets amplifier will be only (1.7V x 0.71) squared/8 ohms= 0.18W which is much less than the LM386 can produce by itself. I have about 30 old 2N3055 transistors never been used. These use to make good amps, I use to do a lot of guitar amp repair jobs with these. 2N30555 is old technology is there something better than 2N3055 now? The old 2N3055 is not very linear so it produces distortion that old electric guitar players like. Modern hifi audio amplifiers have newer much more linear transistors that produce extremely low distortion.